We talk a lot about soil stabilization underneath existing structures, but what about new construction? Before construction can begin on any new structure, stable ground underneath is obviously an essential prerequisite. Unstable soil can be defined as soil that will not stay in place on its own, and therefore requires extra support. 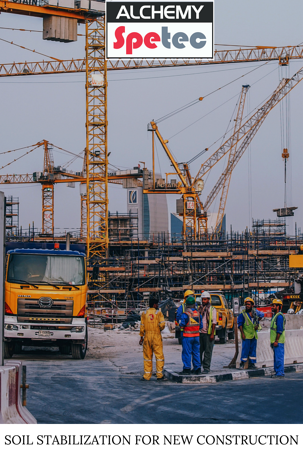 It should be noted that unstable soil can threaten the stability, security, and safety of any potential new construction projects, such as buildings, bridges, and roads. There are a variety of factors that can cause unstable soil including erosion, poor compaction, freeze/thaw cycles and decomposition. Soil can be stabilized with AP Soil 600, Spetec H40, Spetec AG100 and Spetec AG200. Once the bearing capacity of the soil has been increased, then the new construction can begin. Want more information on soil stabilization?